Of course “Cinderella” — though it would prove to be a wildly profitable animated feature — was just an extension of work Walt had done before World War II. True-Life Adventures, however, was something entirely different. When Walt sent a husband-and-wife team of filmmakers to Alaska to take movies, staffers were baffled. And when they saw the endless footage of seals that seemed to so enchant Walt, they were further mystified. “You never saw anything so dull in all your life,” said one. But where others saw miles of boring seals, Walt saw gold. He added music, clever writing, some jokes, and solid editing, and next thing, the water-loving creatures were the stars of “Seal Island,” Walt’s first True-Life Adventure. Though his distributor, RKO, balked at the idea, they were ultimately convinced. 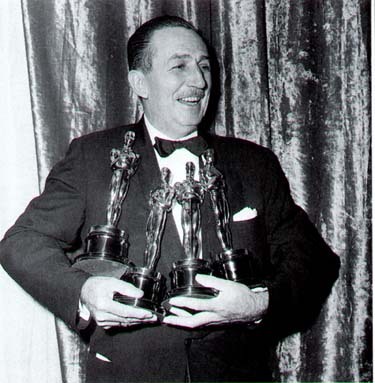 In time, Walt would make 13 True-Life Adventures between 1948 and 1960; eight would win Academy Awards. “Actors are great,” Walt once teased his animators. “You give ’em the lines, they rehearse a couple of times, and you’ve got it on film — it’s finished. You guys take six months to draw a scene.” No doubt, Walt was attracted to live-action films from the beginning. Though his distributor tried to discourage the shift — why try to turn a successful cartoon-maker into just another producer? — they were unsuccessful. And Walt proved himself adept in this new field. His first effort, “Treasure Island” — which was filmed in England and permitted Walt and his family to take a memorable trip there — showed that the same skills that made him a virtuoso of the animated character applied to stars that breathed air. His amazing story sense, attention to detail, and willingness to pursue perfection were keys to success in this field too. In 1949, Walt and Lilly decided to build a new house. They didn’t want a typical Hollywood mansion, preferring one that would be easy to maintain. Not that it was an ordinary house. It featured a projection room, for example, and “a playroom with a soda fountain,” Walt wrote, “where the girls can entertain their friends without disturbing the rest of the household.” Walt loved his soda fountain, too, and Sharon recalled, “He’d go out there and make these weird concoctions that nobody would eat, including himself.” Most notably, though, the house featured a half-mile circle of one-eighth-size train tracks, on which Walt would ride his own miniature train engine. “Walt was not so much interested in a new house as he was in the property, so that he could build his train on it,” said Lilly. A 120-foot-long, S-shaped tunnel was included, under Lilly’s garden. Walt visited amusement parks around the United States and the world. Mostly, he found them to be awful, smelly, dirty, and not particularly safe. He was particularly taken by the Tivoli Gardens in Copenhagen, which was fairly priced and clean as could be. Of course, he continued working in the studio on feature-length cartoons like “Alice in Wonderland” and “Peter Pan”; more True-Life Adventures; and live-action films, notably “20,000 Leagues Under the Sea,” his most ambitious film project to date. Money was no object here; when the squid sequence seemed unrealistic, Walt just ordered it reshot — for $250,000. But the idea of his amusement park consumed him. The company had, by this time, sold stock to the public, and Roy was concerned that shareholders would be furious if he put the company’s resources in such a risky new venture. But the lack of ready money had never stopped Walt before. He borrowed on his life insurance, sold his vacation home in Palm Springs, borrowed money from employees, and founded Walt Disney, Incorporated (which later became WED Enterprises, for Walter Elias Disney), to do the work. That still left him short on cash. No problem. He and Roy struck a deal to create a television show for ABC. In exchange, ABC would put up $500,000 in cash, guarantee $4.5 million in loans, and receive one-third ownership in the park (which it later sold back to Walt). The show, “Disneyland,” would make Walt’s face as famous as his name; his lead-ins provided an opportunity for him to talk directly to his audience in a tone that was natural and familiar and made him a favorite guest in millions of homes. For three years it was the only ABC show in the top 15 rated programs.